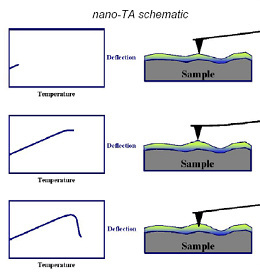 Nanothermal analysis (nano-TA) is a technique to gain laterally resolved information about thermal transitions in samples by using a standard scanning probe microscope with the addition of a heated tip. Initially the setup is used in normal AFM (atomic force microscopy) mode to identify areas of interest on the sample. Then the probe is moved to the identified points and brought into contact with the surface. The temperature of the tip is ramped up. At the point of a phase transition, the material beneath the tip softens. This leads to a penetration of the tip into the sample, which is easily detected by the AFM setup. Thus the temperature of a thermal transition can be determined locally with nanoscale lateral resolution. Our Anasys Nano-TA system in conjuction with the Park Systems XE-100 scanning probe microscope allows to characterize thermal transitions in polymers at nanoscale resolution. Hence the transition points can be measured individually for different microscopic domains or layers in a multilayer system. Additional modes provide a powerful tool for imaging gradients in thermal conductivity or sample temperature and allow local heating experiments. Imaging at different temperatures yields additional information about the thermo-mechanical behavior of the tested specimens.